Bracket support is designed for fastening of the trays on the brackets to the wall. Bracket support 100 110 80 50 0,17 2621460 шт. Bracket support 200 190 160 150 0,23 2621560 шт. Bracket support 400 390 360 350 0,57 2620660 шт. Bracket support 600 590 560 550 0,86 2620063 шт. Bracket support 800 790 760 750 1,15 2620064 шт. Bracket support 1000 990 960 950 1,44 2620066 шт. Bracket support 1200 1190 1160 1150 1,73 2620067 шт. Bracket support 1500 1500 1460 1450 2,19 2620068 шт. Bracket support 2000 1900 1960 1950 2,92 2620069 шт. Bracket support 3000 2990 2960 2950 4,26 2620960 шт. *)product weight is not more than, kg. 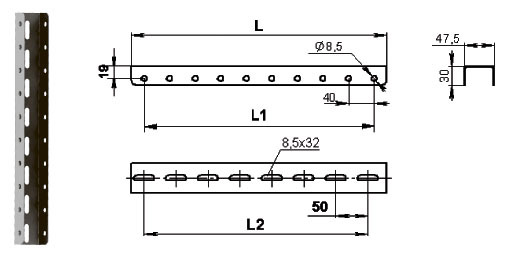 Bracket support 100 - is used for the bracket arm 100, 150, 200, 300.